It’s been so hot and humid lately, with bouts of rain. I learnt a new word today – thundershowers, and that’s what we’re having tonight. When I woke up a couple of days ago, it was super early and as I let MissG out, I noticed the grass was covered in a white sheen! 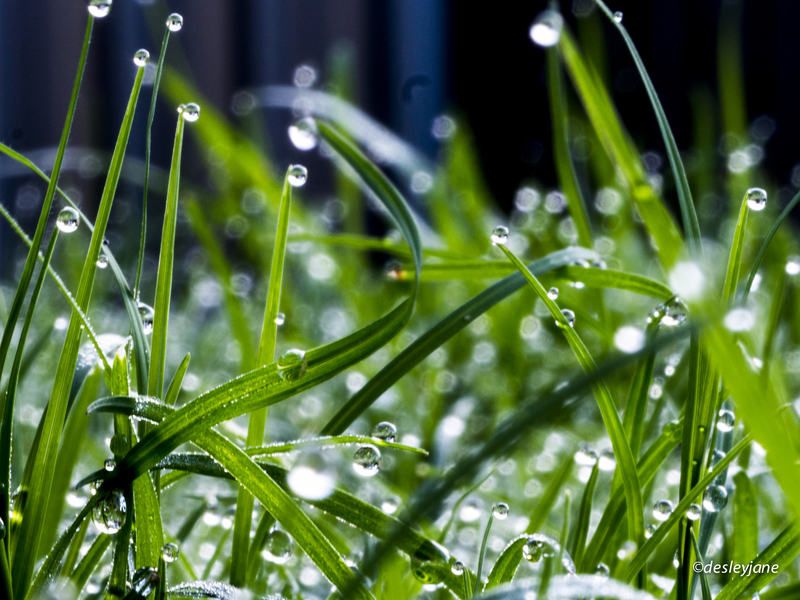 The closest we get to snow here in Brisbane (LOL) – a gorgeous light dew covering the entire lawn. So, coffee and camera at the ready, I went out and lay flat on my stomach on the tiles and took some macro shots of these lovely dew drops. Beautiful start to the day. Especially the first image is really fabulous! What a great start into the day! Thanks so much! I tried the mono on a whim, and really liked it. Great shots. Pity about the heat though. Oh my pleasure my dear! Wow. Excellent photos. The droplets are magic. The first one is stunning. Way to go. While you’re happy with rain…I’m considering to leave this country if it doesn’t stop raining here…lol. The rain is starting to bug me. I took GG for a walk this afternoon and 15 minutes in, started pouring!! We both looked like drowned rats by the time we got home. Yup, I feel your pain – LOL! Oh yes the challenge! Well the OMD is weather proof. And it might make for atmospheric photos? Fingers crossed for a break for you x.
Oh so cold!! I don’t really blame you! I love the lwo angle grass shot,. Both in color and B&W. Thank you so much! Yes, they didn’t last long. Fog is a cool phenomenon, but I agree, we don’t get to see it very often! LOL that’s awesome. Will investigate further tomorrow. Night! I’d love to show these beautiful pictures. In an Australian summer, as these are, it’s a pretty rare thing to see dew. Excellent pics. I especially loved the black n white one. Thank you – there is something special about black and white, isn’t there? Yes….It instantly brings colors to the senses. So beautiful, all those precious drops look like gems. You did great!!! Thank you my dear, I appreciate that! How in the world is this amazingness a natural phenomenon? 😱😱😱 im so jealous! Nice nice photos! And also thumbs up to the choice of low aperture! I am a sucker for a low aperture! Ta. Water displayed to perfection by nature, but captured forever by you! 😁 why doesnt perth give me any rain…! I remember being in Perth late December a few years ago, at the old Chem a Centre in a lab with my robot, a floor-to-ceiling glass window, no air conditioning and (my favourite) the hottest December day since 19-whatever! So hot! I was hoping for rain that day!! Lol aiks. Must have felt like being cooked in a convection oven.. It sure did. We still talk about it when I go back! Beautiful shots, clearly you know your photography and your camera :). I need to get down low too for some of my shots, it really makes a difference. Oh good grief!! +30C here today. Beautiful photos. I sooooo wish it were hot and humid here too. I’m green with envy. What beautiful photos! You’ve captured the morning dew perfectly, I admire your commitment to getting the perfect shot! Oh thank you so much. I got caught up in this angle and that. So much fun! Lovely photos as always. The weather is the complete opposite here! I intend to post some pics later. I do love the monochrome photo. Those were the only photos we took and developed in my photo class (so so long ago), so I have a special place in my heart for them. Question from a novice: How do you get your name on your photos in the corner? With the copyright? I hope you don’t mind the question. Thank you so much! I am hoping to learn dark room developing this year! Phone, there is a nifty so called iWatermark which let’s you do the same thing. I’m sure there are other software packages that can do it, but that’s what I use. Oh frozen drops! That would just make my day! Thanks so much. Ohhh these photos are making me yearn for summer (I’m living in the dead of winter right now). Thank you Britta. I hope it starts to warm up soon! Otherwise I prescribe a blanket, woolly socks, a beanie and a hot chocolate! Same here. I say that I want to live in a cold climate but I’m so used to the heat and humidity that I probably wouldn’t survive! LOL. Hi, I like your pictures. Recently, like a month ago, I did something similar – just woke up in the morning, realized that there´s hoarfrost outside, so I grabbed my camera and took some macro pictures. Do you have any specific macro lens for that or do you just choose Macro mode? This is even more than glorious! I love these, excellent captures!! Fantastic photos, I can’t stop looking at the black and white one! I love when I can make it out early enough in the morning to photograph dew drops on flowers and plants. Thanks Alyson, yes me too, it’s a great time of day!